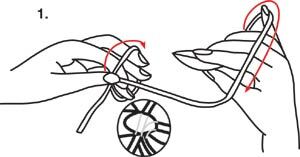 1: For first half of stitch, pass the shuttle to the left under the working thread, between the index and middle fingers, up over the top of the working thread and back to the right through the shuttle thread loop. 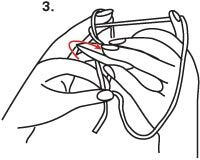 2: At the same time, relaxing the last three fingers on left hand just enough to loosen the tension on the working thread (do not allow the loop to come completely off these fingers), pull the shuttle thread taut so a loop from the working thread forms around the shuttle thread. 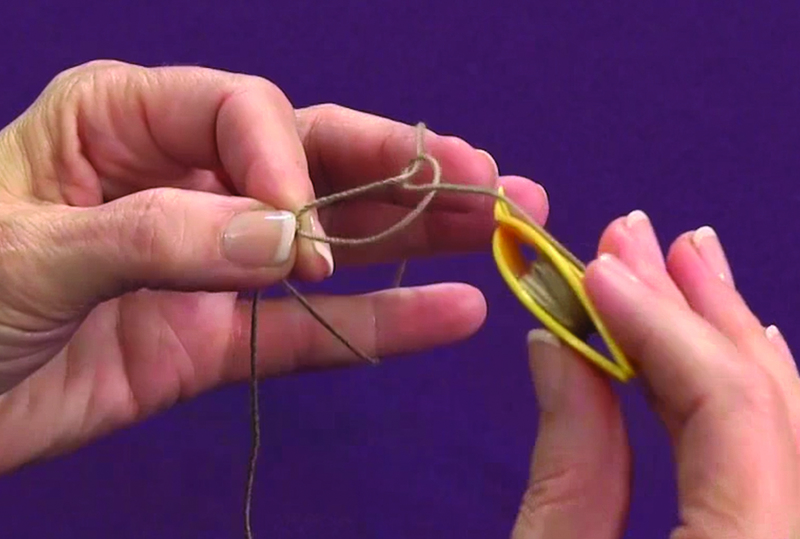 3: Then spread the last three fingers out again and slightly twist the left wrist, tightening the tension on the working thread and the loop on the shuttle thread. 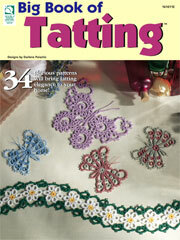 Sometimes this is called the "flip" or "snap"; it is also the hardest part of tatting. 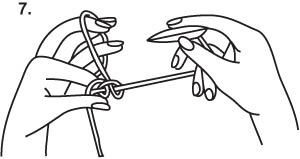 4: For second half of stitch, pass the shuttle to the left over the top of the working thread, down between the index and middle fingers, back to the right under the working thread and through the shuttle thread loop. 5: At the same time, relaxing the last three fingers on left hand, pull the shuttle thread taut so another loop from the working thread forms around the shuttle thread. 6: Then spread the last 3 fingers out again and twist the left wrist, tightening the tension on the working thread and the loop on the shuttle thread. 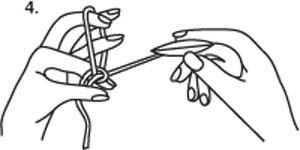 7: If the stitch is properly formed, it will slide along the shuttle thread, if not, cut the knot and begin again. As the stitches are made, the working thread loop must stay large enough for the shuttle to pass through. Slide the shuttle thread back through the stitches to increase the size of the loop. 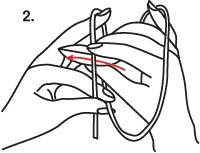 8: Hold the completed stitch between the thumb and index finger while working the next stitch.